Intense, strong coffee beans with an amazing crema. Mainly made up of high quality Arabica beans, with the addition of Robusta to boost the crema and add an extra kick of caffeine, making it perfect as a morning coffee. An exquisite blend with rich, full and luxurious flavours. The classic aromatic notes are simply irresistible. Keep reading to find out about the origin of coffee, what medium roast actually means and how we specially roast our beans. This type of bean was originally founded in the forests of the southwestern highlands of Ethiopia in the 11th century. Arabica is believed to be the first species of coffee cultivated and is still dominant to this day as it takes over 70% of global production. When the bean was discovered, Ethiopia was known as Kefa. When discovered, the Oromo tribe would eat the bean for the same reasons we drink coffee nowadays; for its stimulating effects. It received the name ‘Arabica’ when it was transported from Ethiopia to Yemen and lower Arabia. Arabica vs Robusta, What is the Difference? There are over 100 species of coffee, however the main two are Arabica and Robusta. 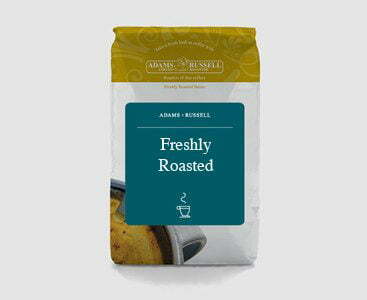 Taste – Arabica has a slightly more favourable taste to Robusta and that is why our blend is majority Arabica. Caffeine – Robusta contains more caffeine. Sugar – Arabica has a higher sugar content than Robusta, which is probably why the taste is slightly better. Farming – Robusta has a higher yield. Shape – Robusta beans are much more circular, whereas Arabica are more of an oval shape. The Plant – Robusta plants can be almost double the height of Arabica. Production – Around 70% of the worlds production is Arabica, with the rest being Robusta. The beans are placed in the roaster in small batches above 200°C. The case of the beans is hardened using flames. They are constantly rotated inside the machine. The beans are checked every few seconds by experts until they see that they are the perfect colour, size, surface texture and smokiness. The beans are taken to the cooling tray. After roasting the coffee beans release natural gases. The technology of the packaging is designed to protect and preserve the essential flavours and aromas of the beans and is gentler than vacuum packing, which strips away essential aromas. I have emailed you a response so we can get your missing bag of coffee to you.